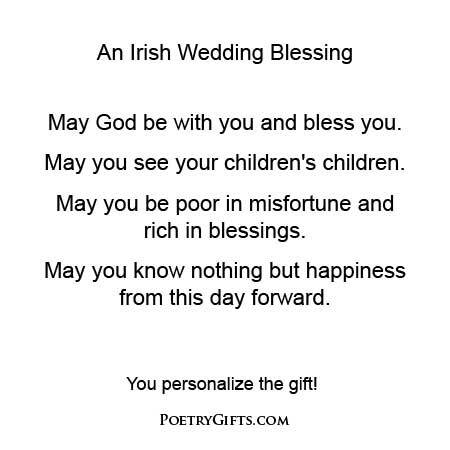 This classic and well known Irish Blessing makes a perfect wedding gift for the bride and groom. The Blessing can be personalized with names, wedding date, and a closing message from you. When you or the Mr. & Mrs. add a favorite wedding photo in the cut-out photo area, this unique present will become a lasting and meaningful wedding keepsake for the happy couple. A truly unique and lasting wedding keepsake! This EXCLUSIVE Poetry Gift is a perfect wedding gift for your son, daughter, niece, nephew, grandson, granddaughter, cousin, good friend... 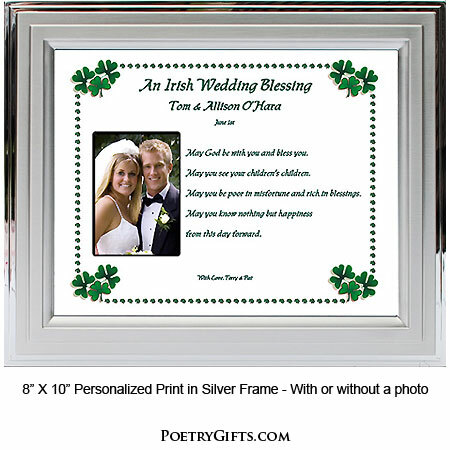 Wish them well on their marriage with this classic Irish Blessing presented in a striking shamrock design that can be personalized with his and her names and wedding date. There's also room for the newly married couple's wedding picture. 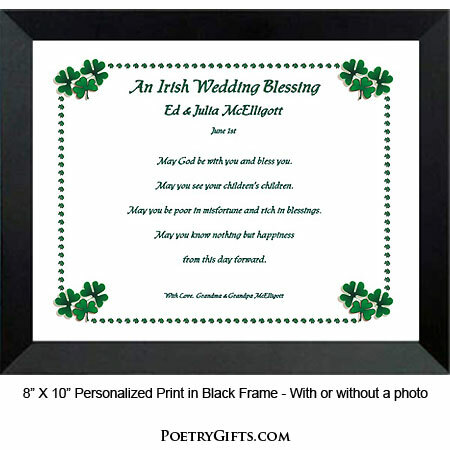 Frame the poem yourself in any standard 8" x 10" picture frame or choose from either our modern black wooden frame or contemporary silver metallic frame. Both frames have an easel back so the frame can be displayed on a desk or dresser or hung on a wall. 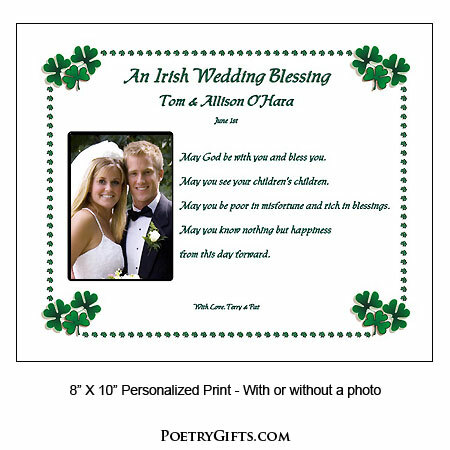 ($19.95 is the unframed price) This Poetry Gift is Meaningful...Thoughtful...Lasting and a beautiful way to commemorate the most important day in his and her lives. 3. Optional Closing Phrase and Name(s): Love, Mom & Dad; With Love, Barb & Ted; etc.